This completely revised and updated edition of Don’t Tell Me What To Do, Just Send Money prepares parents for the issues that they will encounter during their children’s college years. Since our original publication over ten years ago, there has been a dramatic increase in the use of cell phone and internet technology. The birth of the term ‘helicopter parent’ is, in part, due to the instant and frequent connectivity that parents have with their children today. Parents are struggling with the appropriate use of communicative technology and aren’t aware of its impact on their child’s development, both personally and academically. 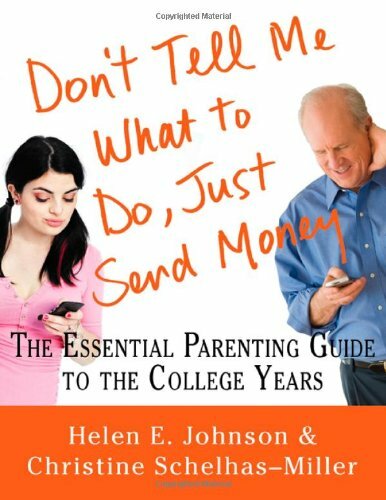 With straightforward practicality and using humorous and helpful case examples and dialogues, Don’t Tell Me What To Do, Just Send Money helps parents lay the groundwork for a new kind of relationship so that they can help their child more effectively handle everything they’ll encounter during their college years.